Lotsaspots is a family home in Bedfordshire, England. Tracy is a member of The Dalmatian Clubs and we both help out with welfare if needed. Tracy is the Bedfordshire Area Representative for The British Dalmatian Club. (To find out more about this scheme feel free to go onto our links page and look at The Kennel Clubs website). 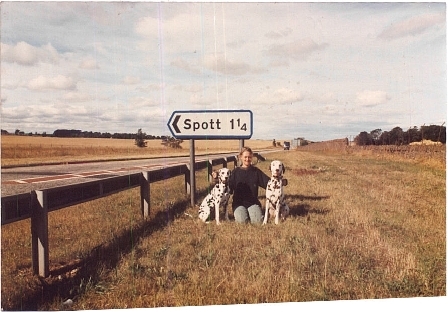 In 1992 we got our first liver & white Dalmatian from Jane Freeman called Micky (Micky Of The Highlodge). met all the other puppies from the litter and had a little family re-union. Herts, Beds & Bucks. One day we decided to go along on one of their outings - this was great fun. Over 20 Dalmatians running all free over fields and then into the pub. Sadly we lost Mickey at a young age. to start with. However the bug gets to you and before you know it. We were travelling up and down the country. It is very enjoyable and a great way to meet people. Whilst at the Championship Dog Shows. We noticed a dog called Charlie (CH Champers Charlie Of Cibrith J.W.). Kennel Club to get this registered. time we kept Missi (Lotsaspots Angels Reply). 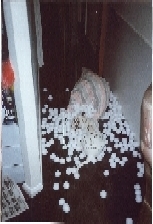 real shame as we had waited for over 2 years to get a puppy from Missi and now this was not going to happen. 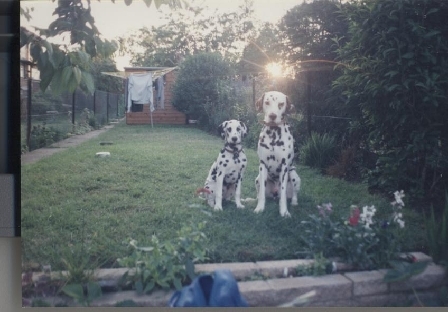 that Rita & Lew Stokes from Elaridge Dalmatians had a lovely litter. We went to see the litter and liked Evo straight away. He is settling into our household very well and having lots of fun keeping all of us on our toes!. 2011 - Our Other Boys! In Christmas 2003 we had an addition to the family. This time it was not a Dalmatian but a little boy called Thomas.